You searched for "Jogen Chowdhury"
known painter Jogen Chowdhury. 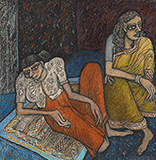 At Santiniketan he studied and also painted various folk traditions and did a comparative study of popular art. on these relationships.”(Jogen Chowdhury in R Siva Kumar Jogen Chowdhury – Enigmatic Visions Glenbarra Art Museum 2005 p. 76) This painting is a unique iteration of the relationship Chowdhury is so fascinated by. As a man and woman have a conversation in bed the contrasts between them scream to be noticed.